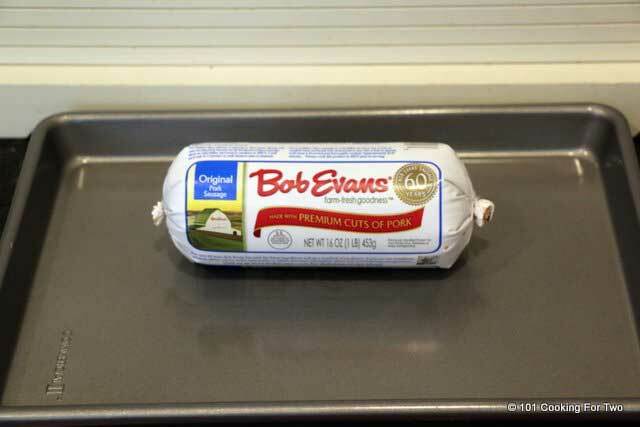 Learn how to cook sausage in the oven with this easy to follow step by step photo instructions. 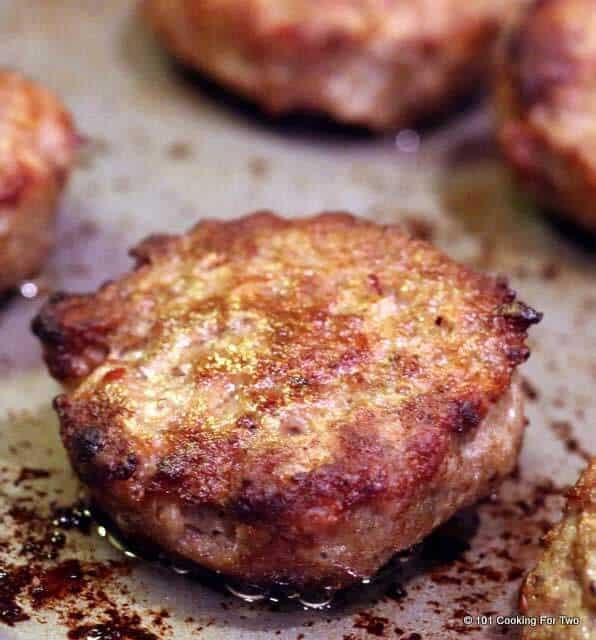 Great breakfast sausage “fried” in the oven. 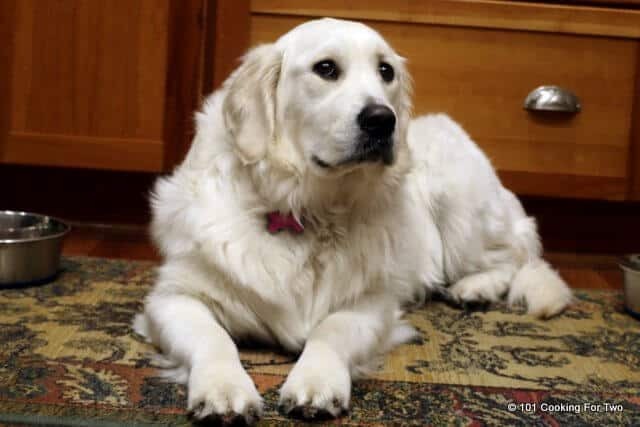 Why are you standing at the stove and making a mess? Editor’s Note: Originally Published February 14, 2015. 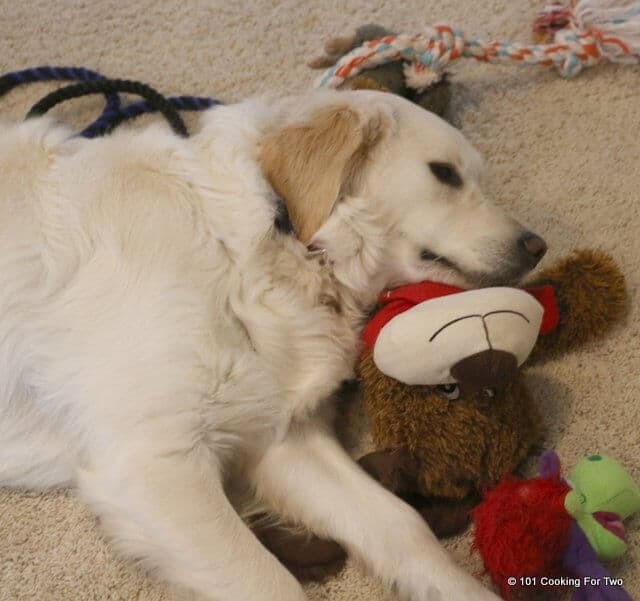 Updated with expanded explanation and photos have been re-edited since originally published. I have been cooking bacon in the oven for several years but why not sausage? Everybody still stands at the stove and make a mess. Well, let’s put a stop to that now. Just pop it in the oven, flip once and done. That is a recipe? What oven temperature to use to cook sausage in the oven? If I’m just doing the sausage by itself, I use 400 convection or 425 in a conventional oven. But I have done this as low as 350 conventional and as high as 425 convection. So use the temperature you are using for your other dishes. I frequently do this with my Oven Baked Blueberry Pancakes to may my wife’s favorite breakfast for special days. A lower temperature will take a few minutes more, and of course higher will cook a little faster. When is oven baked sausage done? Like any ground meat, the minimum safe internal temperature is 165. Please use a meat thermometer to tell. Do not by color or time please. Use that thermometer. Due oven temperature variables and sausage variables, they may not be nicely brown. I turn on the broiler for a few minutes at that point to get the color we want if needed. You may use patties or links. Also, this will work with larger dinner sausage I’m told, but I have not confirmed that. We love Bob Evans but use your favorite brand. Almost any over safe pan will do, but a 1/4 sheet pan works great. Whatever pan you use, it needs some sides to prevent a mess. I would try to avoid something with high sides that might interfere some with the cooking. A larger sheet pan would be preferred to a cake pan. There is no need for a rack, and I don’t use foil since it cleans up well. If you have sticking on you chosen pan, then a piece of parchment paper would be a good idea. Here is a tray of sausage patties in a 375 non-convection with my baked pancake. These were done at the same time as the pancakes (25 minutes with a flip at 12 minutes), but I hit them with the broiler for 2 minutes at the end to brown up to my taste. So adjust to what you’re doing. At 400 convection, the broiler was not needed, and it was done in 18 minutes total. Preheat oven. I’m using 400 degrees convection. Anything from 350 to 425 with or without convection should be fine, but you will need to adjust time and perhaps need a couple of minutes under a broiler at the end to brown up some. Spread sausage over a rimmed baking tray so they don’t touch. I’m using a non-stick baking pan. A spray of PAM doesn’t hurt. You could use parchment paper or non-stick foil also. Bake for 10 minutes then flip the sausage. Finish cooking to a nice color and internal temp of at least 165. 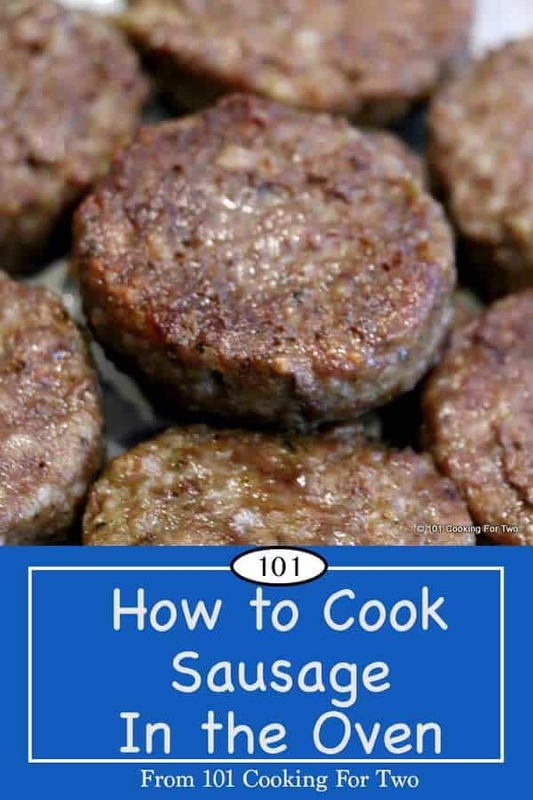 Learn how to cook sausage in the oven with this easy to follow step by step photo instructions. 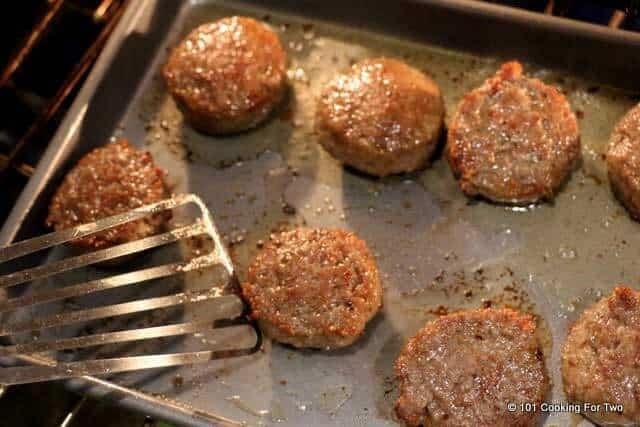 Great breakfast sausage "fried" in the oven. Preheat oven. I'm using 400 degrees convection. Anything from 375 to 425 with or without convection should be fine but you will need to adjust time and perhaps need a couple of minutes under a broiler at the end to brown up some. Spread sausage over a rimmed baking tray so they don't touch. A spray of PAM doesn't hurt on the tray. You could use parchment paper or non-stick foil also. Bake for 10 minutes then flip sausage. Finish cooking to nice color and internal temp of at least 165. 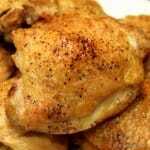 Use a few minutes of the broiler at the end if needed to brown better. 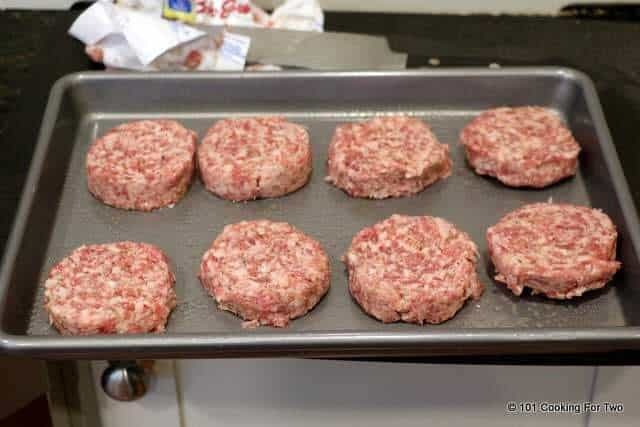 Use the sausage you want, links or patties. Using a sheet pan works very well. You need a pan with some sides. If you have sticking, use some parchment paper. This has never happened to me. The only really important thing is an internal temperature of at least 165. A few minutes of the broiler may be needed at the end to get the browning you want. Thank you very much for your detailed answer. Indeed, a deep-fryer is not the best choice, I wanted to consider a more budget option. Plus, my kitchen is not very spacious and it is difficult to fit large-sized appliances there. I think I better wait a little, save more money and choose an oven. Many thanks for your advice and helpful articles. Inspiration to you! Tell me, please, if a deep-fryer is suitable for such cooking technique? The manufacturer claims that it can cook not only French fries, but also battered chicken strips. https://best-kitchen-appliances.net/deep-fryer-review/ So, I’m wondering if I will be able to cook sausages like in your recipe using this deep-fryer. I don’t have an oven. I don’t see that deep frying sausage is related to baking it but it will definitely work. Stovetop works well but is a mess for me. I can not give you an estimate on the time needed for deep frying sausage. I don’t see a deep flyer as a good substitute for an oven. 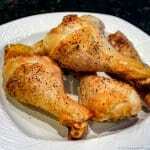 If give a choice between an oven and deep fryer, the oven wins hands down for usefulness. Maybe look at a countertop convection oven. I have lots of stories, here’s one. A local restaurant was getting well know in the “health crowd” for their excellent turkey sausage. Of course they were looking for low fat. Turned out that they were deep frying it. Not really healthy or low fat. 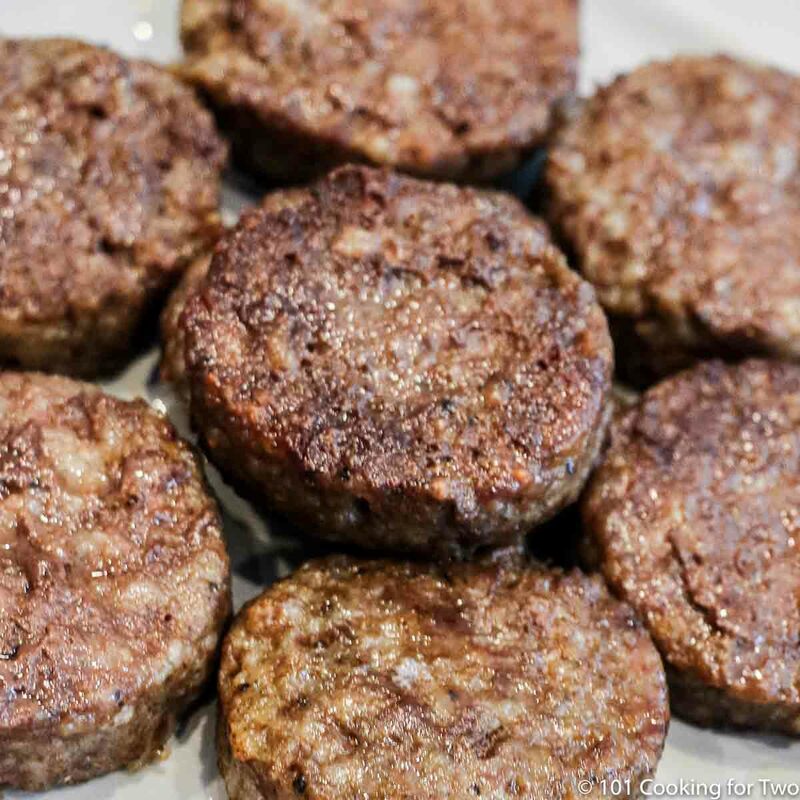 What is the cook time/flip time if you are coking frozen sausage patties? I have never used frozen. Having said that, I believe it would work well. I will “guess” how I would do this. But my guesses are usually fairly good. I would think you would need about 20% more time. Flip at about 11-12 minutes. Cook to 165 internal temperature and hit it with a little broiler if needed at the end to get more browning. If you try it, please report back. Somebody else may benefit. Have you ever baked the the sausage roll as one whole piece? Baking a whole roll of sausage intact is just not going to work. You need to get the temperature of the thickest part to 165 degrees to be safe. That will be tough without the outside being overcooked and dry. How do you cook link sausages in the oven? While I have never done it, I would say a definite yes but the time might be a bit less to get to the required 165 internal temperature and I think they won’t brown very well so you will probably want a little broiler time at the end. Thanks for the recipe. During the summer, I use my gas grill instead of the oven to help keep the house cool. I preheat the grill to 400F, place the sausage on heavy duty aluminum foil and follow your instructions. How much mess is made I’m the oven from the splatter?? I have never had any significant issues. But I use very lean sausage. If you are having some, switch to a pan with a higher side like a cake pan. I am so happy I checked this out. I been doing bacon in the oven and called myself being lazy today so without a thought I put the sausage in the oven then searched to see if i could do this lol. Thanks for these tips!!! Thank you Dan for this recipe. It probably seems pretty simple to some people, and it is — just what I was looking for! 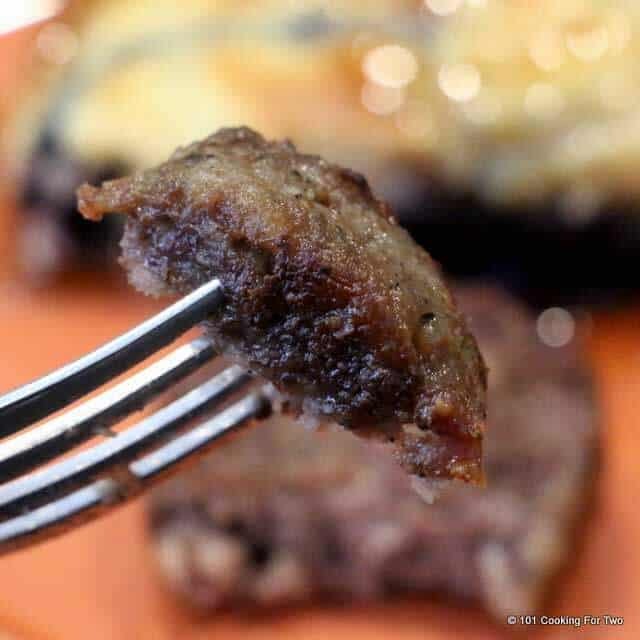 I tried it with turkey roll sausage, formed into patties. They didn’t cook very well on an earlier attempt in the skillet because there was very little fat, but with your recipe in the oven, perfect! I did not heed your advice about using parchment or a greased pan, so there was significant sticking. That was my problem. Next time I’ll do as you suggest. You are right that it seems a little like a how to boil water recipe but I took me 60 plus years to figure it out, so I thought I would not be alone. It is just so much easier and better in almost every way at least for me. You are right about a lean sausage sticking but I have a non-stick quarter sheet pan that works great. Any suggestions for cooking ground (crumbled) sausage in the oven? Thank you. I want to cook a couple of pounds of sausage for make ahead breakfasts. I thought of oven cooking and hoped someone else had done it to provide me with temperature and times to start with. This is the only way to do sausage and it is so much better also. 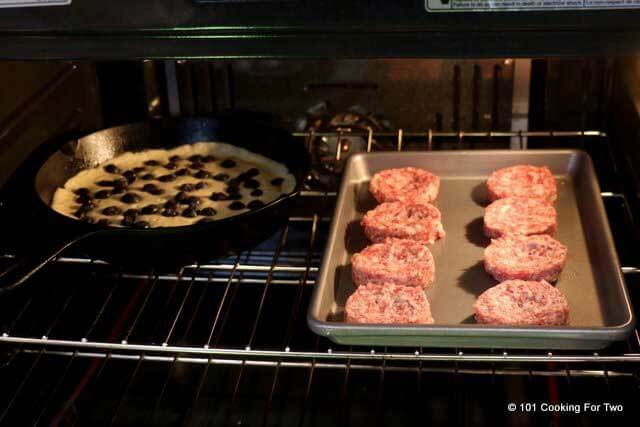 I have been doing my sausage patties/links & bacon in the oven for YEAR’S! I had no idea it was such a foreign concept to so many. I just assumed it was the lazier version of what others did only I managed to figure a simpler & quicker way of doing it lol. Glad I am not the only one out there. I find the sausage also is better since I don’t over cook. When you flip them do you cook another 10 minutes on the other side? Yep about. Cook to an internal temperature of 165 and nice color. That is usually about 8-10 minutes on the second side for a total cooking time of 18-20 minutes. If you get to 165 and the color is still not what you want, hit it with a minute or two of the broiler. Wow!!! Why didn’t i think of this before. 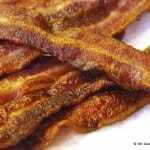 Cook bacon in oven all the time.. Today cooked the whole tube in slices, we ate 4 and i saved 4 for tomorrow!!!! I would rate this an 8!!!! I like oven so much better. I get it all to the right temperature and don’t overcook and dry them out. Not to mention the mess. Good stuff; it is the only way I will cook patties from here on. To keep the wife happy and oven clean, I line the rack with foil to catch any spatter. But there is less oil jumping all over the place because it is a much more even cook in the oven… in my opinion. I haven’t done stovetop for a long time. You are so right, the cooking is so much more even and it stays moist. I’ve also been cooking bacon in the oven for many years and wondered about cooking sausage that way. Thanks for your instructons. I’ll be doing this tomorrow. Perfect? just made this, this morning! Will forever cook my sausage this way now! I was looking for an alternative to the skillet this morning. I will try this technique. Oh my gosh. My hole tire life I been cookin sausage in a skillet spittin grease all over my linoleum! After a few weeks/months of that my kitchen flore is like a ice skatin rink covered in dust! This way is the best way to make sausage! I can’t believe I never thunked of this ever in my hole life! No more greasy floors! Muchyass grassiass omigo! Thanks for the note and rating. I wonder why I didn’t do it before. Tried your recipe this morning. Will never fry again. Trying the bacon tomorrow . wow. The sausage looks so delicious. Will try it later. Thanks for the note. It is as good as it gets.